Home » Blog » Blog » Meeting Joe Lhota – Future Mayor of New York City? 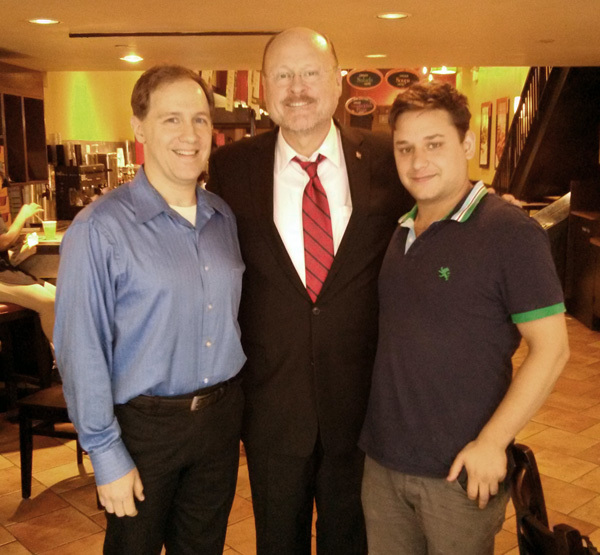 Yesterday I was at a popular midtown lunch spot with friend and online consultant, David Markovich, where we were fortunate to meet Joe Lhota, the leading Republican candidate for the next mayor of New York City. We spent some time talking with Joe and his political consultant, Jessica Proud, hearing more about his campaign and getting to know the man beyond the polished image we are provided on television. So what is Joe Lhota like on a personal level? He was unpretentious, friendly, charismatic and surprisingly understated. He amusingly quipped “welcome to my office” when he first met our impromptu greetings at the popular hotspot, well known for the free WiFi used by many as a temporary spot to set up business operations. Joe certainly knows New Yorkers. He seemed genuinely interested in hearing more about us, our thoughts on the campaign and was gracious with his time. I told him that I was an IP attorney and ran our popular legal help and advice website, TheLaw.com. Mr. Lhota also informed us, power Android mobile technology users, that while he preferred to use an iPhone and Blackberry at this juncture, he would keep an open mind to consider alternatives should the need arise. You might find this hard to believe but Joe never even asked us for our votes. This was just conversation, not a nonstop effort campaigning. This kind of soft sell usually indicates to me a focus on substance over form. Perhaps Joe Lhota is the type of responsible mayoral candidate that New York City desperately needs. Joe invited me to reach out to him again in the future. I am hoping that he will be able to provide us with some time for a short follow up article that we would publish in The Law Journal covering some of Joe’s thoughts on the most important legal topics that concern New York City residents. In the meanwhile, best of luck to you Joe Lhota – you certainly made a good first impression on this New York City voter.